Above: miniature novelty playing cards from the late 1940s or early 1950s with a charm of their own. Probably published as small prizes at fairground or seaside amusement arcades (such as the 'Rotary Merchandiser'), the cards measure 50mm by 29mm and were produced with red or blue background. Images and nostalgia submitted by Peter Ford. Above: "Fairylite" containing 52 cheaply-made cards + one joker. 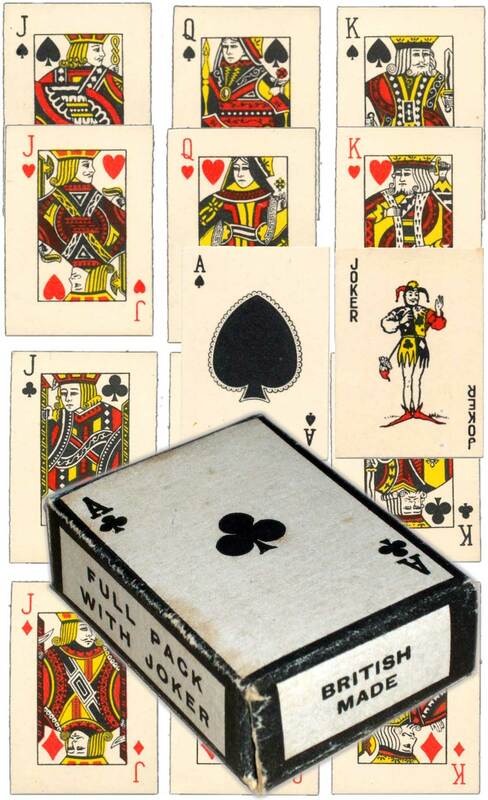 The ace of spades is different but they are in the same style of box with the legend "Junior Playing Cards" top and bottom. These are "Empire made" so there may be a time period over which production shifted. Unusually, it looks like they printed sheets of each single card and then cut them out, rather than sheets of complete decks. Images courtesy Matt Probert. Above: another anonymous "British Made" children's pack, late 1940s or early 1950s, containing 52 cards + one joker. Images courtesy Matt Probert.